This theme contains multiple home page slider variations for users to select what is best for their websites. Full width, Thumbnail and Nivo Sliders have large images to display with some information and Left Image slider shows normal size image with beautifully displayed information and best rated recipe on the top. This theme comes with four beautiful color skins. You can easily choose any skin from theme options according to your mode. 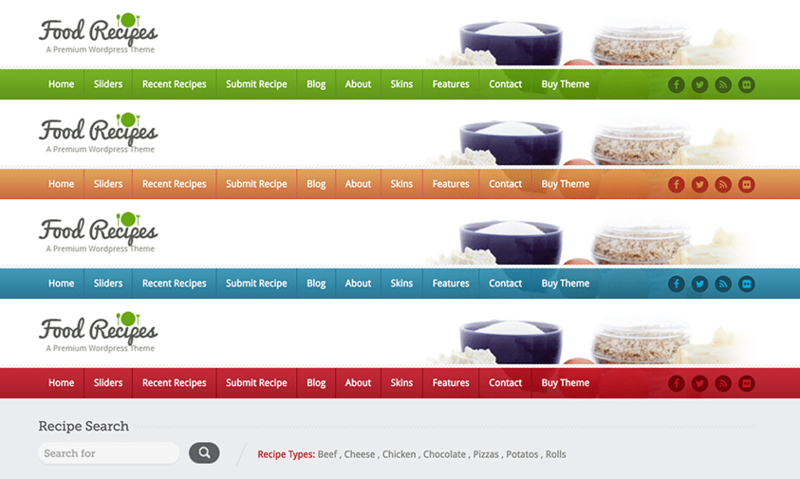 Food Recipes WordPress Theme has very easy to understand theme options. You can control many aspects of your site from these options. 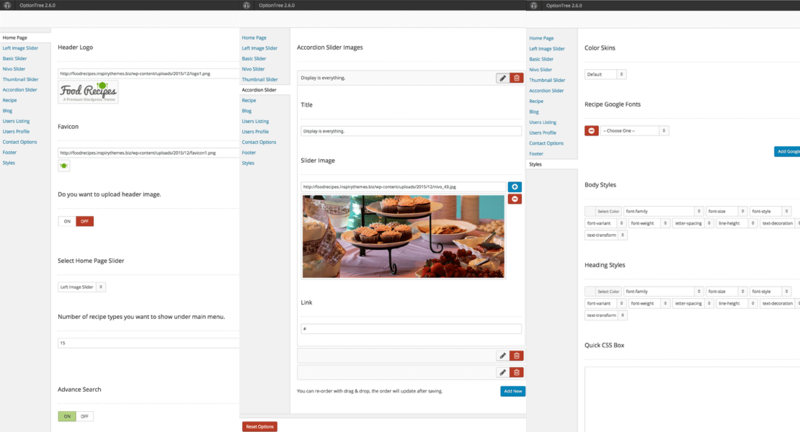 It has home page management, slider settings, recipe and blog listing controls, contact page settings and many more. Visitors can find recipes of their needs more easily with this advanced targeted search. Recipes can be searched by many properties they contain. This theme has beautifully designed chefs and authors listing templates. It lists normal WordPress users according to your needs and display their roles you provide in author profile page. On single author template you can find all the recipes and posts published by that author. This theme provides a front end recipe submit template so people you allow can submit recipes from front end and leave for approval. Food Recipes theme has a comprehensive set of theme options that will help you configure and modify things around your website more easily. Food Recipes theme provides responsive layout, So your website will look awesome on big screens as well as on tablets and smartphones. Food Recipes theme's main package contains a ready to use child theme to make it easy for you to get started with modifications and keep updating the parent theme whenever the new update becomes available. 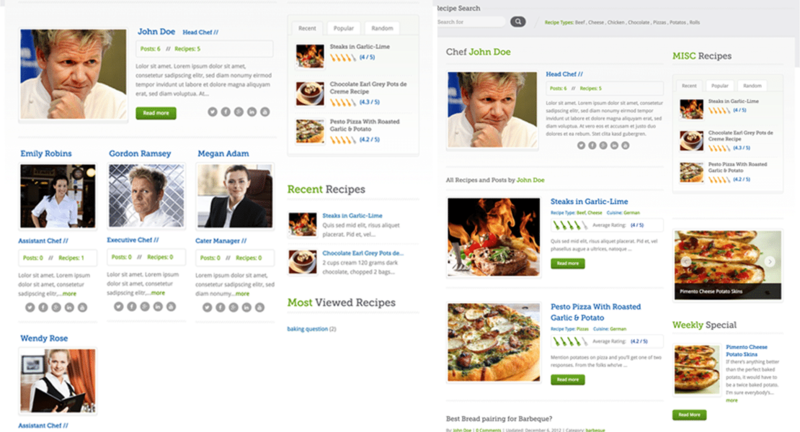 Food Recipes theme provides an easy to understand yet detailed documentation. 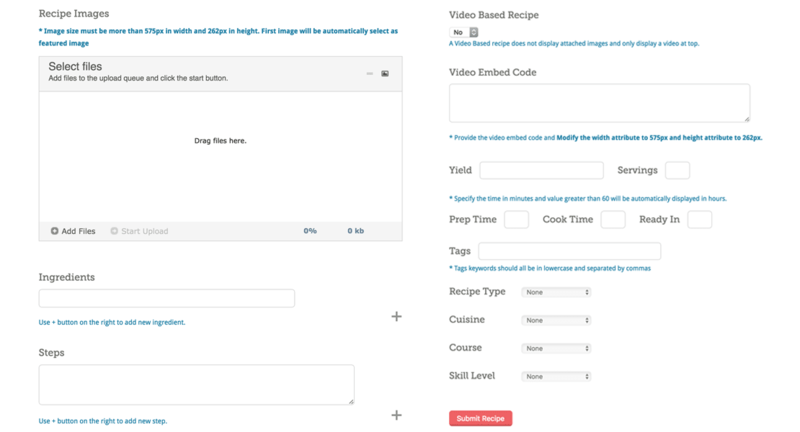 Food Recipes theme provides one click demo import feature to help you quickly setup your site like the theme demo and learn all the things by observing how those are done on demo site. So, What are you waiting for? 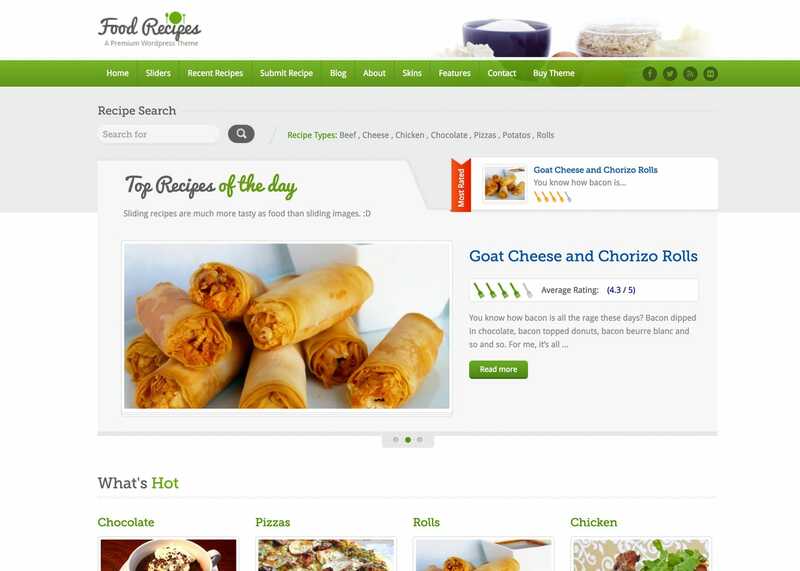 Install Food Recipes and take your website to next level.